John M. Rosenfield vividly describes the efforts of the Japanese monk Shunjobo Chogen (1121-1206) to restore major buildings and works of art lost in the brutal civil conflict of 1180. Chogen is best known for his role in the recasting of the Great Buddha (Daibutsu) and the reconstructing of the South Great Gate (Nandaimon) of Todaiji in Nara and its huge, dramatic wooden guardian figures. This study concentrates on these, and other replacement statues and buildings associated with Chogen, and situates the visual arts of Japan into the spiritual and socio-political context of their times. Through meticulous study of dedicatory material, Rosenfield is able to place the Buddhist statues made for Chogen in new light. The volume also explores how Japan’s rulers employed the visual arts as instruments of government policy, a recurrent tactic throughout the nation’s history. It includes an annotated translation of Chogen’s memoir, completed near the end of his life, in which he recounts his many achievements. In chapters on East Asian portraiture, Rosenfield claims that surviving statues of Chogen, carved with mordant realism, rank among the world’s most eloquent portraits, and herald the great changes that were to permeate Japanese religious and secular arts in the centuries to come. 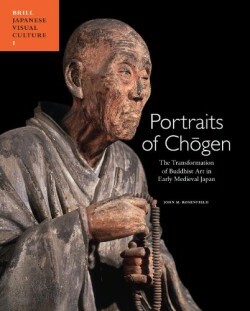 While Chogen has been the subject of major art exhibitions and extensive research in Japan; this is the first book-length study to appear in the West. John M Rosenfield is Abby Aldrich Rockefeller Professor of East Asian Art, Emeritus, and Curator of Asian Art in the Harvard University Art Museums, Emeritus. After teaching at Harvard for 25 years until his retirement in 1991, Professor Rosenfield has continued to lecture and publish widely on Japanese Buddhist painting and sculpture and early modern Japanese artists. In 1988, he received the Order of the Rising Sun from the Japanese government for services to mutual understanding between Japan and USA, and in 2001 he was awarded the Yamagata Banto prize for his contributions to the understanding of Japanese culture abroad.